In the penultimate episode of The Flash’s third season, I finally feel something about this Savitar plot! Remarkably, “Infantino Street” is decently-paced, well-acted, and includes enough moving parts that I spent over an hour on Twitter discussing potential loopholes for what happens at the end. It’s clear that the writers of The Flash had the elements to make for a great story, but were tripped up by all the time they had to fill — when they’re able to get down to it here at the end of this storyline, it’s compelling enough to cause me some actual viewer’s anxiety! Which is really saying something since, up until this point, the Savitar plotline has done more to bore me into an anxiety-free state than my actual anxiety medication. We’re starting things off gloomy as Iris’s friends and family prepare for her prophesied last day alive while a song literally called “Murder Song” plays over the somber montage. Thanks, show! Real nice of you! As the song fades out, we see Iris and Barry in bed together and Iris makes the “I’ll probably die soon, please do whatever I ask” request of late-night caviar. Barry can tell she’s feeling like her fate is already set in stone, protests that everything will be okay, then goes to find caviar anyway. When he’s gone, Iris gets her phone and starts to record a message we don’t see. Later, we see clear evidence that Barry did indeed find some late-night caviar because their apartment is covered in jars and crackers. Barry, take a second to clean up all this mess, would you? Anyway, Barry gets a call from Cisco that seems to put some pep in his step, and we see them later on outside ARGUS, talking to Lyla. They want to borrow an energy source from the secret government agency because it’s the only thing Cisco can find to properly power the Speed Force Bazooka that Tracy Brand is developing — i.e., the thing that can trap Savitar. Lyla turns Barry’s request down because Barry can’t be trusted ever again since he went back in time and erased Lyla's baby. Even the fact that Iris will absolutely, 100% die without the power source does nothing to change her mind. That's pretty cold, Lyla. Speaking of cold, after declaring that he wants to break into ARGUS and steal the power source, Barry is informed that the building is protected by a device that dampens metahuman powers. So Barry decides to enlist the help of someone who doesn’t use metahuman powers: the Hammiest of Hams, Leonard Snart as Captain Cold. Apparently, Barry has to travel way back in time to do this — something to do with Legends of Tomorrow, no doubt — and I’ve stopped trying to makes sense of this universe’s time travel rules. Shouldn’t this be another Flashpoint? Or result in Time Remnants? Or have literally any consequence at all? While Barry and his new crime buddy are preparing to steal the power source from ARGUS, Barry tells Joe to take Iris as far away as possible — and don’t let him know where, since Savitar would share the memory. Joe takes Iris to Earth-2, where they can hang out with Harry, reminisce about the time Iris switched rooms with Barry so she could sneak out more easily and Joe used money from her and Barry’s college fund to go on a Blues Cruise. 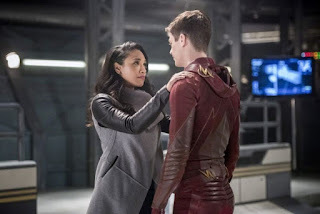 The scenes between Joe and Iris are unbelievably charming, especially when Joe starts singing a song (“What Does It Take” by Jr. Walker & The All Stars) he apparently used to sing when Iris was younger, and they dance together on Earth-2. It turns out that ARGUS has employed King Shark as a guard dog for the power source, which is both bizarre and troublesome for well-intentioned thieves like Barry. At first, Barry thinks his only option is to kill King Shark, but Snart — of all people — talks him out of it by using knowledge gained from watching Shark Week on the Discovery Channel. They put King Shark to sleep with the cold from his cold gun, steal the power source, set off an alarm, and get trapped. Again, Barry is torn between doing what’s morally right and doing what’s expedient: leave Snart behind to be eaten by King Shark and make his escape, or wait for Cisco to open the locked door to save Snart and risk getting caught. Barry chooses the latter, and is immediately caught by Lyla. Thankfully, though, Lyla’s faith in Barry’s ability to do good things was restored by him choosing to save Snart. She also seems to have realized that she was literally letting Iris die by denying Barry use of that power source, so the combo of Barry Can Do Good Things and Iris Will Die convinces her to let Barry go. Hey, Lyla? Nice that you came to your senses and all, but Barry doing “good” things was never in question — it’s Barry doing smart things that’s iffy. Iris dies. She’s killed in the exact same way that Barry saw her get killed, because the bazooka fails to do anything to Savitar — because, and I can’t stress this enough, Savitar literally knows everything Barry has planned. He knew the bazooka would be used and knew how to counter-act it. Considering that we had a whole episode in which this idea was a major plot point, I can’t imagine that the writers would be so sloppy and ignore it, or the characters would be so dumb and forget it. Therefore, I get the feeling that the ending we see in “Infantino Street” is not the true ending. Instead, I think it’s an ending for Barry’s benefit — a way for the rest of the team (or at least a few key members) to trick Savitar through Barry and completely removing the “Iris will die” element from the confrontation. And credit to the show, because they manage to make the last five or ten minutes of the episode truly exciting, despite my suspicions that what plays out isn’t what actually happens. 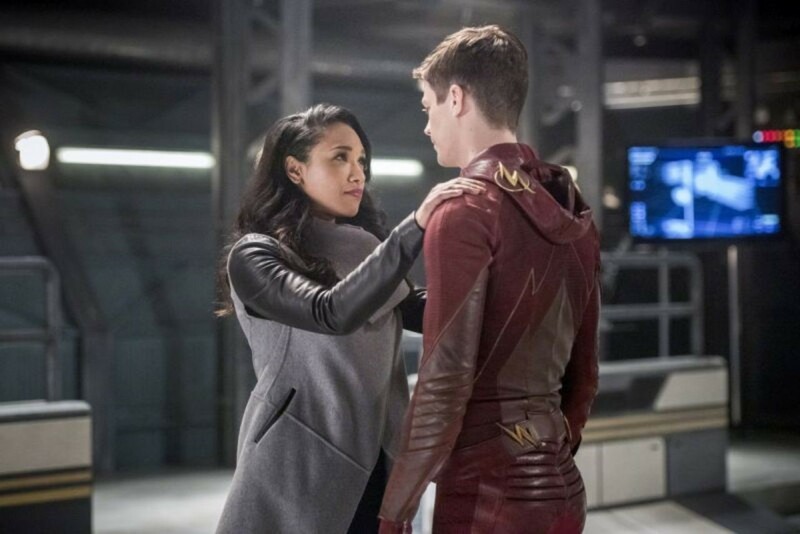 The actors are all perfect: Grant Gustin still portrays a Barry who is desperate — despite knowing exactly how futile his pleas are — to convince Savitar not to kill the woman he loves. Jesse L. Martin as Joe, slowly and tragically realizing that he’s just witnessed his daughter’s murder. Even Anne Dudek, who plays Tracy Brand, is great when Tracy realizes the thing she made just failed and the horrible event she’d only just started to understand was going to happen and hurt the nice Team Flash people anyway. Candice Patton really pulls on the heartstrings, though. Not just for Iris’s actual death scene (set to that “Murder Song” again), but also because the show cleverly — and painfully — intercuts the video we didn’t see her film at the start of the episode. And that video? Iris’s wedding vows to Barry. If the leading theory of the face-changer being used to save Iris is true, and some other person has been Iris most of this episode (my vote’s for H.R.) then there were a lot of really awkward moments. Missing this episode: Julian. And there were so many obvious things he could announce dramatically! I have such expectations of an intricate, perfectly planned finale but let’s be real, here: it’s probably going to be a mess of plot holes and stupidity.